View of “Bruce Conner: CROSSROADS,” 2014. Repetition is key to the film’s power. With the introduction of each new shot—a placid seascape dotted with ships—we wait, anticipating the explosion. The alternation between aerial views and straight-on shots provides a variety of perspectives, so that each eruption is astonishing in a different way. With his characteristically sharp eye (a found-footage pioneer, he was one of the first to appreciate the anonymous stylistics of educational and industrial films), Conner foregrounds the tension between the terror of the event and the involuntary beauty of the footage, with its organic shapes in motion and extremely subtle gradations of light and dark. The original electronic musical score by Patrick Gleeson (in the first half of the film) and Terry Riley (in the second half) provides two contrasting aural perspectives. 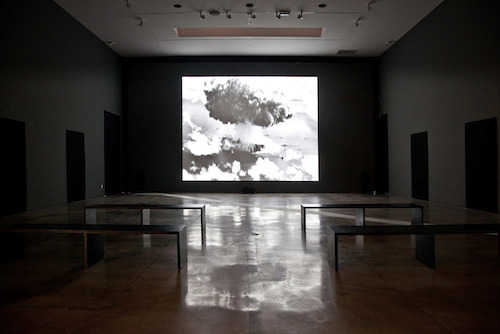 Presented on a giant thirty-five-foot screen in a spacious dark room with four benches, this is an exemplary model of what contemporary digital moving image restoration and exhibition can achieve.